Precious metals futures changed little Friday with gold, silver and platinum advancing and palladium falling. Only gold and silver gained on the week, however. Gold for June delivery on Friday rose $7.60, or 0.6%, to settle at $1,336.10 an ounce on the Comex division of the New York Mercantile Exchange. "Gold was given a lift by the soft U.S. dollar. The inverse relationship between the two markets is holding up, and even though there are concerns about the economic conflict between the US and China, it is the greenback that is having the biggest influence," MarketWatch quote David Madden, market analyst at CMC Markets. "Fourteen market professionals took part in the weekly survey. 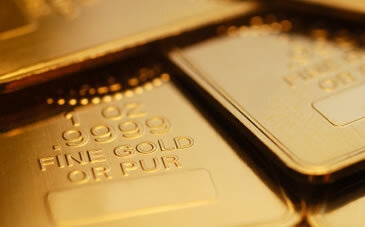 Eight respondents, or 57%, called for gold prices to rise over the next week. Another two voters, or 14%, looked for gold to fall, while four, or 29%, see a sideways market. Meanwhile, 663 voters responded in an online Main Street survey. A total of 312 respondents, or 47%, predicted that gold prices would be higher in a week. Another 261 voters, or 39%, said gold will fall, while 90, or 14%, see a sideways market." Elsewhere, silver for May delivery rose than a penny to close at $16.362 an ounce. Silver futures gained 0.6% this week after dropping 1.9% last week. They are 4.6% lower on the year so far. July platinum added $2.20, or 0.2%, to settle at $917.50 an ounce, but posted a 1.6% weekly loss. Palladium for June delivery lost $4.95, or 0.6%, to $895.15 an ounce, tumbling 5.2% for the week. The two metals are also lower on the year with losses of 2.2% for platinum and 15.6% for palladium. Gold rose $3.50, or 0.3%, to $1,331.20 an ounce. Silver lost 3 cents, or 0.2%, to $16.275 an ounce. Platinum was unchanged at $911 an ounce. Palladium fell $3, or 0.3%, to $909 an ounce. As for their weekly prices, gold rose 0.6%, silver was virtually flat with a half-penny loss, platinum shed 2.7% and palladium plunged 6.3%. United States Mint bullion gold coin sales were muted for a fourth week in a row. Silver bullion coin sales climbed by 210,000 ounces this week after rising by 285,000 ounces last week. This week, only American Silver Eagles gained. Last week, splits included 50,000 ounces in Pictured Rocks 5 Ounce Silver Bullion Coins and 285,000 ounces in American Silver Eagles. Mouse – Very astute observation, my friend, although by this point calling him “obsessive” is, I would venture to say, vastly understating the immensity of it. After all, we are now up to ONE HUNDRED TWENTY-THREE down votes and counting; in fact, every single comment I post gets one not just automatically but almost immediately! That poor deranged numbnut has clearly dedicated whatever sadly has to pass for his life to following me around like a lost puppy with rabies. Palladium is great for numismatic coins / rare / good investment / for bullion, not so good. Had it’s spike and now on the dive. Hope those that invested in the unsecured element sold during the spike late last year. Mouse – Excellent call, and one I would not have made if you hadn’t just pointed it out. So, the bullion is almost in freefall while the collector iterations of palladium are still a great investment. Good to know this for sure; thanks! By the way, Mouse, I do believe you’ve become a victim of “guilt by association” as every time I give you a vote “up” you subsequently get a vote “down” (which as a result has you ending up with a “0” balance since the votes here negate each other as opposed to being tallied separately) from what I can only assume is the self-same obsessive troll as had previously latched his very purpose for existing on to me. Clearly, you’ve given him more to live for. How funny! You know as well as I do that these examples of sad – and bad – behavior, ones which have been of late all too frequently manifesting themselves on this otherwise sensible site, without question also extend to these fools’ “real” – as in non-internet/web – lives as well, that is, if they even have anything that could even remotely be called that anymore. Think of it; to have to get one’s (apparently exclusively negative) jollies here is truly a sign of existing within not just a very narrow and limited life but also of being in possession of an extremely lazy brain and a complete lack of imagination. And so it goes. Once again, and interminably so of late, I feel called upon to rest my case. For some reason, I don’t have a Palladium numismatic coin in the collection. I think it is time for me to hunt one down. If anyone has any suggestions of mints that have produced them, I am all ears…or in this case, eyes. Mouse, are you ever in luck! This fall (no specific release date published as yet) the U.S. Mint will be producing a Proof One Ounce Palladium Coin at the West Point Mint. The online numismatic scuttlebutt is that regardless of either the spot price of palladium or the Mint’s sale price for the coin, this one will be jumped on by both collectors and investors alike as if they were all a big swarm of very hungry fish going after just a few juicy wiggling worms! Clearly that will be one of those days – of which there really haven’t been all that many of late, regrettably – when it will pay to have one eye on the clock for high noon EDT and one finger on the [keyboard] trigger to finalize the order with the Mint. Here’s hoping it works out for you! Thanks old collector. I have been online and found the coin on the mint site just before I read your post lol I am definitely gonna get my hands on one. You’re entirely welcome, Mouse. By the way, I want to assure you that I never for a second thought you wouldn’t be able to locate this information yourself. On the other hand, what sort of a lackadaisical fellow collector would I be if I didn’t at least make the effort to point you in the right direction of this particular “holy grail” regardless? I also had the very strong feeling that the minute you had sniffed this out you weren’t about to even for an instant consider letting go of the scent until you actually and finally had one of these fabulous beauties in your hand; in this I believe I am unanimous! The funniest part of this is that the MUTE STOOGES who follow us around do vary in NUMBER but never falter in collective STUPIDITY.